a) You're boiling meat in water. b) You're paying through the nose for the privilege. ...read no further. I agree with you: shabu shabu is, for the most part, expensive for what it is. I am not going to change your mind with this post. So stop reading now. You have been warned. Are the rest of you still with me? Good. Yes, even though I know I could accomplish the same thing at home (I even have access to an induction shabu shabu pot), I still occasionally find the need to go out to get it. Why? Well, making shabu shabu yourself inevitably results in an unwanted excess of raw food that lasts for days. There is only a finite number of dishes you can make with shabu shabu ingredients. So when the itch to water-boil meat hits (which, fortunately, only happens once a year for me), it's usually laziness that brings me to restaurants like Shabu Shabu Bar. This one, however, I'd been hearing about for months. It actually ups the ante on shabu shabu's DIY nature in that they provide a mortar and pestle for you to grind your own goma (sesame seed sauce). Call it silly, call it stupid, call it counter intuitive. It's the same reason why people do 1000 piece puzzles or climb Everest: just so they can say they did. Anyway, the grind-your-own-goma bit is just for show. No matter how much elbow grease you put into it, the seeds will never turn into a paste. Instead, the waitress (who will pity your efforts) will pour in the real sauce from a bottle and then amp it up with garlic, scallions and a dash of chili oil. She'll do the same for the ponzu if you let her. And that's another thing about Shabu Shabu Bar that endears it to its fans: for a DIY joint, you get more service than you would at a normal sit-down. It's like they're compensating. She'll skim the scum off from your pot, mix your sauces, serve rice, make conversation, and even prepare your noodle soup with the now flavorful water once you've finished cooking your meat. For our meal, in the guise of being smart and savvy shoppers, we shunned the smaller plates (which go upwards to $20 for around eight to ten slices of meat) and decided to go whole hog, er, whole cow, on the meant-to-be-shared $50 Yokozuna Platter, which the menu said consists of about 40 or more slices of rib eye. Only when it arrived did I realize what we had we gotten ourselves into! Sure, most of it was air, but this was sliced beef formidably stacked into a literal meat mountain, looking much like those giant paper-mâché volcanos kids make for their grade school science projects. The Man v. Food enormity of the task ahead made me queasy. I'm not the kind of guy who relishes overstuffing myself. When I looked over at my lovely dining companion, and remembered how small her appetite was, I thought to myself: we're screwed. We're never going to finish this, even if I had fasted the whole day (and I hadn't). At my first swish, the lightness and wispiness of it gave me confidence. The ponzu sauce really takes the edge off the richness of the meat, which, by the way, is planed to the sheerness of tissue paper, sliced against the grain to disintegrate on contact with your tongue--probably one of the best shabu shabu meats I've had. Around the fifteenth slice, I started getting the meat sweats. I abandoned my rice, using it more as a resting platform to put my cooked beef before I can summon the strength to pop it in my mouth. By the final two pieces I felt lethargic, drunk of beef and excess. I took the udon noodle soup our server thoughtfully made for us and took a few sips. I couldn't even make myself eat a single strand of noodle. Later at home, I was doubled over on the couch, groaning and feeling guilty at how much I ate, and actually, so was she. Yeah, maybe leftover shabu shabu ingredients in our fridge wouldn't have been so bad. I used to eat at another shabu2 place in Fountain Valley for lunch occasionally, but it was just....too...expensive for what you got out of it.$20 for lunch just doesn't work for my budget, especially when I leave still hungry. This place seems like it kicks it up a notch in service at least, if not in economics. Shabu Shabu really only just works at home when you have at least 4 or more people so that everyone can eat all the veggies and stuff! But I do like the idea of this. That sesame sauce looks delicious! And you ate all that with just you and your friend! I am impressed. That would do for me with 3 or 4 people probably. There is a Shabu Shabu in Arcadia, and it is like boiling meat in water! Usually instead of water it should be some type of soup. There is a really good hot pot place in Monterey Park that divides the hot pot into two parts (spicy and plain). Compared to Shabu Shabu, this place is like heaven. When I get the shabu shabu jones again, I think this will be the place...and you're right, it's the DIY aspect. It is, for what it's worth, fun. And for some reason that doesn't make sense to even me: it feels like its healthier (though it's not), just because your boiling instead of frying it in its own fat at a Korean BBQ. Makes no sense, I tell you! Dang. I wish I thought of that! I was doing stir fries, noodle soups, and then more shabu shabu when I ran out of ideas. And to think that I would've already had the Cheez Wiz! Oh believe me! I was as surprised as you are that we finished it...surprised and then horrified. But the menu actually said that only two people can share the thing. I think that's how they get you. Yep! I've been to Little Sheep and others like it who serve Mongolian Hot Pot, which is almost an entirely different experience. What's the one in Arcadia called? I like those too! There's even one in OC. Stay tuned! The meat looks great, but I can't help but laugh at the thought of you guys eating it all. Just reading that made me hurt. Ugh. 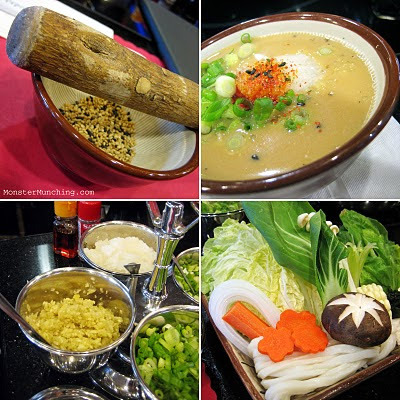 have you tried the california shabu shabu in costa mesa? they have one in fountain valley as well, but the one in costa mesa looks and feels better. personally i'm not a big fan of shabu, except for at cali shabu. it has garlic, scallions, two bottles of some kind of sauce that you can add to your water to make a broth. personally, i would recommend adding the "hot drops" to your dipping sauces. i'll try hitting up the shabu shabu bar as well, but so far, i don't go to any shabu places except cali. Never really bother to try shabu shabu, like you said it's over price. I make a version that you would wrap with rice paper, vermicelli, assorted leaf greens and dip with a shrimp paste base sauce. It's especially fun and filling especially with adventurous close friends. Oh boy, did it ever. I think I had toast for lunch the next day. I don't regret eating here, but I regret eating so much! Actually yes I have! Last year to be exact. And that capsicum extract is lethal stuff. I couldn't stand it! Had to start all over with a new bowl of sauce. Now that sounds wonderful. I've had a similar thing at bo 7 mon restaurants. Are there actual restaurants that specialize in only that? Are you going to say Hot Pot City? There's two in Arcadia: one is called "Hot Pot" and the other one is "Money Pot Shabu Shabu." Hot Pot is Chinese style. They make their own sour veggies which is quite interesting! Personally I prefer Little Fat Sheep- now Happy Sheep (thanks WC for the update!) though out of all the places I've been to. But now I just do it at home! 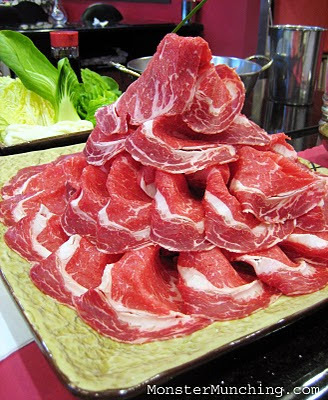 i definitely don't eat shabu shabu in LA where I don't understand why it's so expensive. in Taipei, you can get all different kinds (mala spicy, vegetarian, sukiyaki, all you can eat, etc) at half the price. i'd rather spend my money on good korean bbq! Thanks for the tip! Whoa, two in the same city. There used to be a Little Sheep in Rowland Heights at Colima and Azusa, but it went away. I saw WC's post on Happy Sheep. Looks like it's at the place where the stinky tofu joint used to be. I don't understand why it's so expensive here in LA either. If I had to guess it must be the ornery codes and stuff. Or maybe because one guy started charging a lot and people came, so the next guy said, "alright I'll charge the same as that last guy". Oh how I know the feeling of "meat sweat". I don't eat alot of shabu shabu but this place seems pretty standard and it looks clean. Did they have miso soup base at this place? And in the same plaza, just three stores away from each other. But neither get very good business. Times have changed and what used to be this ultra busy plaza 5 years ago is a tad deserted compared to the plaza next to Din Tai Fung with Sinbala. It's so easy to whip up and I don't think there is any restaurant that does it the way I do. HA! I'm glad I'm not the only one who's suffered the meat sweats. The Meat Sweats: (noun) The queasy realization that you've already reached your limit on protein consumption, yet you're not even half done with what you ordered. Symptoms include nervous perspiration on the brow. Not that I know of (but they might if you ask). Our server actually used the remainder of our goma to flavor the noodle soup (along with a soy-based flavor agent). Yeah that DTF plaza is insane. They should build a third DTF way off somewhere else that needs more foot traffic! MMM...shrimp-paste sauce! Is it pink and has scallions, with a little bit of hotness? I may have had something similar recently. In any case, if you ever decide to open a Bill's Hot Pot Restaurant, I'm in! Not the pink shrimp paste - its the gray one. pestle and mortar would be perfect to crush the good stuff. I just go off the top of my head till I get the taste I want. I've introduce this to a few of my Caucasian friend and they've enjoyed it. Veggies were really fresh, nicely cut and presented (they even sliced a little star out of the top of the shiitake mushroom). Very neat. Have to say, though, that the beef is not up to the cook-at-home quality you'd get of rib-eye from Mitsuwa or Marukai. The only restaurant that matches that quality, that I've found, is Shabu Shabu House in Little Tokyo. Read a review the last time I was there not long ago, and it turns out that SSH is perhaps the first restaurant of its kind in LA. If you're ever up there, I highly recommend it. Thanks for reporting back on your trip to SSB. I'm always looking forward for feedback on some of these places I try. 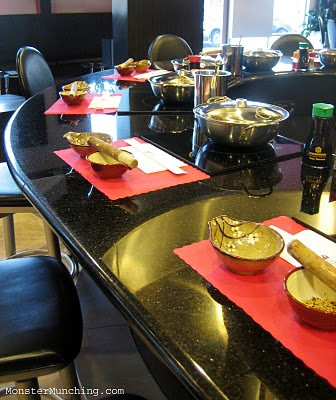 Actually, I've been to Shabu Shabu House in Little Tokyo! But that was a long time ago. I remember it being very good; but that was way before I started blogging or paying attention to the finer details. Perhaps it's time to go back. Oh man, it's 1 am...craving shabu and somehow I got linked to a review on your site! I'm glad i read about this shabu place so that I can try it on my next visit to CA! I was gonna ask if you've had bo 7 mon before, but i saw your old review. I had that yesterday on 4th of July. haha. Happy belated 4th of July, Elmo! Happy 4th Christine! Long time no see! Yeah, I need to go back to try bo 7 mon sometime soon. It's been too long. So far, I've hit two of Little Saigon's best. Have at least 1 more I haven't tried. A true favorite of mine. Never thought I'd pay to do it at a restaurant since I have it at home on a weekly basis. Everything is fresh and staff is very helpful. Gotta put a ton of garlic in the ponzu sauce if you want to do it right! Yes, I think I would have to say in terms of quality, the place is one of the best. But then, I tend to go with pricing when it comes to shabu shabu, and for that I would have to say that Mitsu E Shabu Shabu in Fullerton, with the $8-$9 lunch specials is about where I want to be. Hopefully they're still offering it! Yes, the garlic is essential!